Ah, the simple pleasure of a perfectly stacked soda display or an impeccably organized closet. Who doesn’t feel at least a little reenergized after a bout of over-the-top arranging? Turns out, our squirrelly friends might feel the same way about neatly-organized nuts. In a new study in Royal Society Open Science, scientists from University of California Berkeley report that nut-hoarding squirrels are quite particular about their food caches, putting their nuts away in neat little groupings—a strategy that helps them remember where all their hiding places are. The finding points to just how mentally taxing caching nuts for winter is, but the organizational abilities of squirrels may only go so far. As “scatter-hoarders,” squirrels create lots of little caches where they store their food, lest a natural disaster or crafty competitor wipe out their stockpile. By having lots of little stashes all over the place, the squirrels ensure that at least some of them will remain safe. But the more stores you make, the harder it gets to remember where they all are. That’s where a bit of organization goes a long way, cognitively speaking. When we humans organize, we tend put group things into discrete units, a strategy known as “chunking.” We do it every day with phone numbers, for example. We mentally break the number into smaller strings—such as the area code, then the first three digits, then the last four—rather than try to recall an unbroken string of ten numbers. The same type of chunking helps us remember locations, too. If you have 100 books, you’re never going to be able to remember the exact location of each one if you put them on a bookshelf at random. But you could readily find any given book if you split the books into categories—say, fiction and non-fiction—and took a mental note of where each category, or “chunk,” is placed. Chunking is considered a key mechanism of human cognition, and studies have shown that rats and other animals can also use this important memory recall strategy (or mnemonic) in laboratory settings. But tests for chunking in wild animals are few and far between. 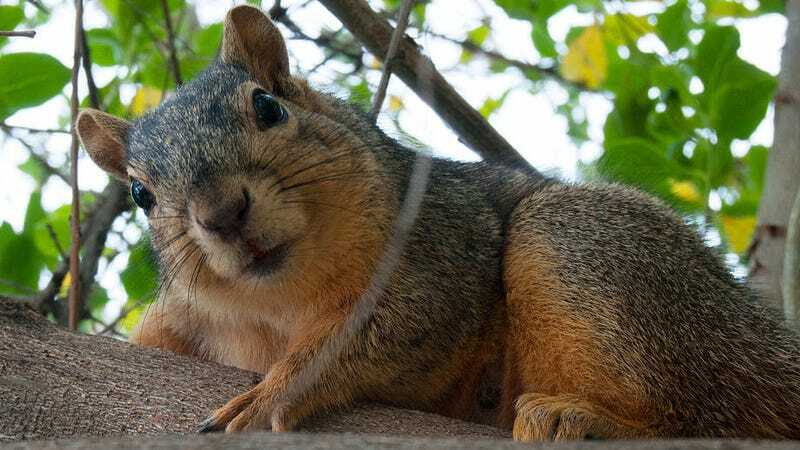 To see if squirrels are chunkers, researchers from UC Berkeley offered 45 free-ranging Eastern fox squirrels (Sciurus niger) a series of 16 seeds from a central location: 4 each from 4 different species of plant. Some of the time, they gave them sequentially in species groups—4 almonds, then 4 hazelnuts, then 4 pecans, then 4 walnuts. Other times, they gave the nuts in pseudorandom order, where they were mixed and no species was given twice in a row. When the squirrels hid their prizes, the scientists followed with a GPS to record the location of each cache. They then ran the experiment again, but this time, every time a squirrel hid a nut, the experimenters gave out the next nut from that spot later on, thus handing out the nuts from a different location each time. They then compared how often the squirrels overlapped nut varieties in their caches in each of the four types of trials. Fastidious little hoarders that they are, the squirrels took the nuts handed out from the single central location and sorted them into species-specific storages. It didn’t matter what order the nuts were given in. “This first demonstration of chunking in a scatter hoarder underscores the cognitive demand of scatter hoarding,” the authors wrote. If it wasn’t mentally taxing to remember all of their hiding spots, the animals wouldn’t need a mnemonic like chunking to keep track of things. But when the researchers started handing out nuts from multiple locations, the animals’ neat little system started to break down. “Squirrels spatially chunked their caches by nut species but only when caching food that was foraged from a single location,” the authors explained. When the nut species were given in sequence from multiple locations, the squirrels still kept the species overlap minimal, including up to two species per cache. When everything was mixed and handed out from different locations, however, the rodents’ organizing skills folded. Instead of grouping their nuts by species, the animals appeared to simply avoid caching in the same areas as they had previously. It’s unclear why the animals changed their strategy. The pseudorandom order from multiple locations put the greatest memory burden on their tiny little rodent brains, so the animals should have needed a mneumonic to accurately remember their caches even more than before. It’s possible that their mental capacity simply couldn’t handle the overload of information. Or, the authors suggest the strategy switch may have been due to the increased energetic demand of grouping nuts by species and location when the different nuts are handed out so far apart from one another in both time and space. It would have been really interesting to see if the breakdown of chunking made a difference in the animals’ ability to find the nuts later on, but alas, that was outside the scope of this study. When you think about it, the mental energy it must take to be a scatter hoarding squirrel is actually quite astounding. Many people find it hard enough to locate their keys when they put them down ten minutes ago—imagine remembering where you buried a nut in a forest weeks after! We should give these critters more credit for the cognitive feats they accomplish every day.